Silver vegan leather track shorts. Model is 5’10” and wearing a size small. 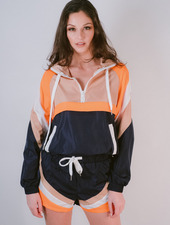 Pastel blue and beige color block windbreaker shorts with mesh inside lining. Matching jacket sold seperately. Model is wearing a size small. Navy, gold, white and neon orange colorblock track shorts with drawstring waist, and side pockets. Coordinating pullover is sold separately. Model is wearing a size small.